The step down into the Living Room created a problem for the wheelchair access that was needed. 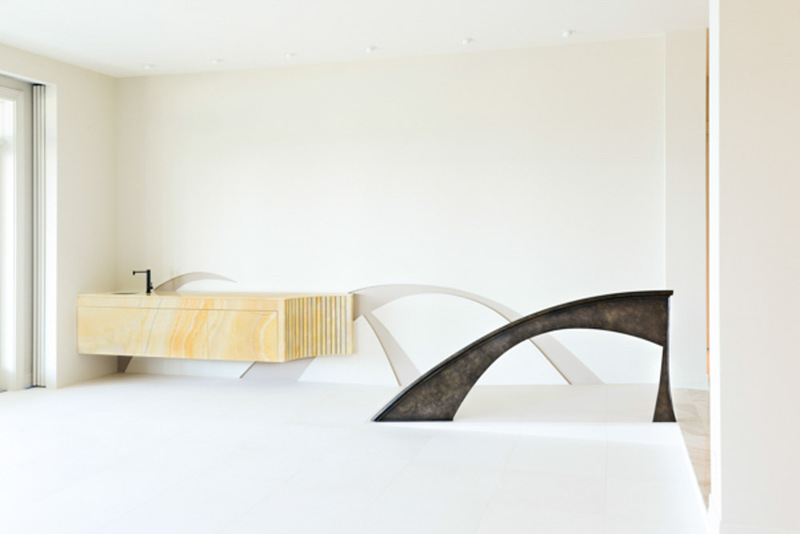 The wall of the Living Room was designed as an interior architectural Art Wall, including the ramp, custom railing, wall relief and a floating onyx bar which glows from light behind the onyx. These components become one instead of simply being multiple single entities. The limestone floor flows seamlessly onto the ramp and up to the higher level. The single arc railing is a compliment to the main stair railing in the home and continues the branding of this house. The concave end of the onyx bar is designed using 2” wide strips of onyx, flanked with pieces of bronze to create the curve. The floating bar allows the relief art on the wall to continue above and below the onyx.